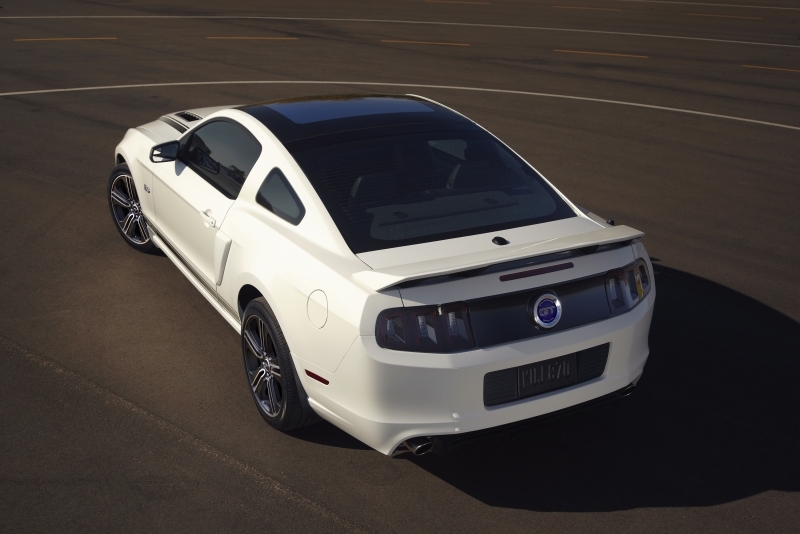 The 2013 Ford Mustang GT isn’t really about what’s new; it’s about what Ford has already gotten right. But that can’t be the company line, of course. Instead, all the Ford folks wanted to talk about was the car’s umpteen enhancements for 2013. We’ll give you the highlights. The front and rear fascias have been tweaked, with the former now clearly evoking last year’s supercharged GT500 and the latter sporting cool LED taillight surrounds. Newly standard niceties include xenon headlights, a manual mode for the automatic transmission, and a hill-hold feature for the six-speed manual. The available 4.2-inch LCD driver information display includes a dragstrip-style acceleration timer replete with countdown lights. Also, the GT’s V-8 now makes 420 horsepower, a dizzying eight—eight—more ponies than before. But the real story here is that, with a radically new Mustang likely on the way for 2015 at the latest, we may well look back on this 5.0-liter Mustang GT as one of the last pure American performance cars. Sure, electric-assist steering has crept in lately, and the drive-by-wire throttle could be more responsive, but the five-point-oh still provides that intimate car-and-driver connection we love. If you’re with us, then don’t tarry; put a current Mustang GT in your driveway before it’s too late. The Mustang GT’s 5.0-liter V-8 is among the best engines in the world, combining power, sound, and refinement in an almost Germanic fashion. The six-speed manual shifter is wonderfully short and precise through the gates. Handling is remarkably accomplished; we defy anyone short of a professional racer to detect the Mustang’s live rear axle in enthusiastic driving. Unlike the Camaro and Challenger, the Mustang offers decent outward visibility and reasonably manageable dimensions. 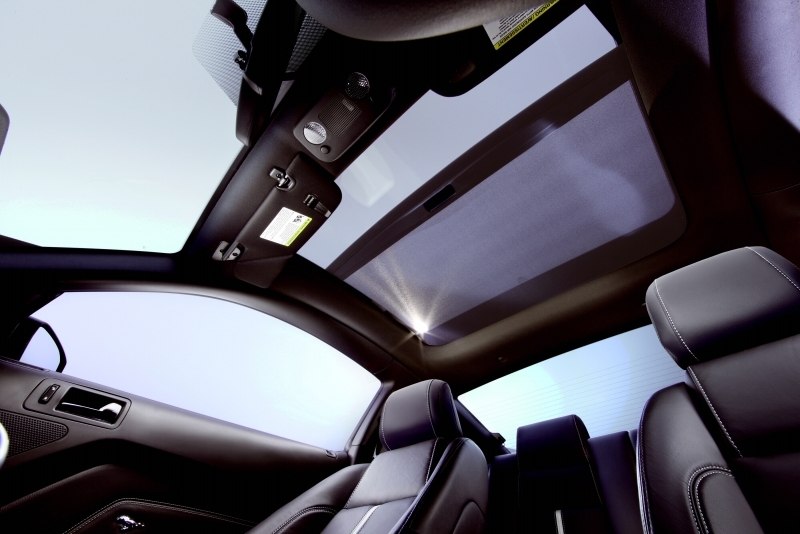 Our test car’s panoramic roof reminded us of a Porsche 911 Targa. Although Ford has improved the Mustang’s interior quality dramatically, the door panels don’t match the dashboard’s materials quality, and the center stack looks cheesy with its mishmash of generic black buttons. Like many modern Fords, the Mustang has aggressively angled front headrests that don’t pivot to provide relief. The Mustang GT really shouldn’t be pigeonholed as a “muscle carâ€ alongside with the Camaro and Challenger. We understand the historical reasons for this association, but seriously, the Mustang is more akin to luxury sport coupes like the Infiniti G37 than to the big bruisers from Chevy and Dodge. Hustling the Mustang GT along a winding road, you can feel the car shrink around you, as all great sporting cars do, yet the ride remains extraordinarily supple. We’d be fine without the adjustable electric steering—“Sportâ€ was too gung-ho and “Comfortâ€ too loosey-goosey, so we just left it in “Standardâ€—but the chassis nonetheless responds eagerly and predictably to aggressive inputs. Forget about the smoky-burnout stereotypes; the Mustang GT is a true athlete, a world-class performance coupe that just happens to have 420 horsepower and a solid rear axle should you encounter a dragstrip in your travels. We’d only ask for quicker reactions from the electronic throttle, which oddly isn’t adjustable. The 2013 Ford Mustang GT is powered by a naturally aspirated 5.0-liter V-8 that cranks out 420 horsepower and 390 lb-ft of torque. You can get an automatic transmission with a new-for-2013 rocker switch on the shift lever that enables manual gear selection, but the Mustang GT has one of the very best stick shifts you can buy. Stubby, substantial, and always precise, this shifter loves to be rushed during acceleration runs, yet the lightweight clutch makes ease work of rush hour traffic. The first engine that came to mind as we put the 5.0 through its paces was the BMW M3’s otherworldly 414-horsepower, 8,400-rpm V-8. The Mustang’s V-8 redlines at 7,000 rpm, mind you, but it’s got a similar high-rpm urge—and like the M3’s motor, the 5.0 is almost too refined, leaving us pining for a more aggressive exhaust note. We’re still recovering from the shock of realizing that the 2012 Infiniti G37 Coupe 6MT, with its less-civilized, less-powerful V-6, costs $44,200, or nearly half again the 2013 Mustang GT’s starting MSRP. 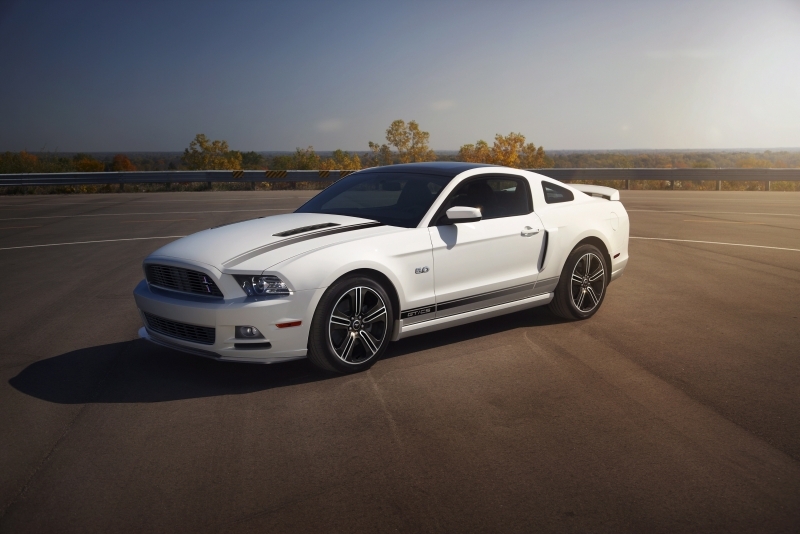 The 2013 Mustang GT with the six-speed manual is EPA-rated at 15 miles per gallon city, 26 mpg highway, and 19 mpg combined. That’s a pretty strong showing for a performance car with 420 naturally aspirated horses under the hood. It bugs us that the crisp 4.2-inch LCD driver information display—which is the only way you can get the Track Apps collection with the acceleration timer and so forth—isn’t available on the base Mustang GT, at least as of this writing. It’s a big price jump from the base GT to the GT Premium, which has the 4.2-inch display as standard. In other technological news, you can pimp out your Mustang GT with a navigation system and dual-zone automatic climate control, but ‘Stangs so equipped will be pushing 40 grand. However, the base $30k Mustang GT is rather sparsely equipped, as Ford sticks you with manual cloth-upholstered front seats and charges extra for the Sync voice-command system—which includes “AppLinkâ€ functionality, so you can tell your Bluetooth-connected smartphone what kind of music you’d like to hear on Pandora. The GT Premium trim level provides most of the stuff we’d want—power driver seat, LCD driver information display, Sync with AppLink, even a Shaker audio system—while stopping short of the $40k madness. But we’d be sorely tempted to add our test car’s Glass Roof, even though it costs an extra $1,995. The brilliant power driver seat in our California Special test car featured a bottom cushion with a fully independent tilt function, so we were able to dial in our desired seat height and then tilt the cushion to taste. Alas, the front headrests are angled forward as demonically as ever, and there’s no way to tilt them back. Moreover, the Mustang folks stubbornly refuse to add a telescoping steering column. 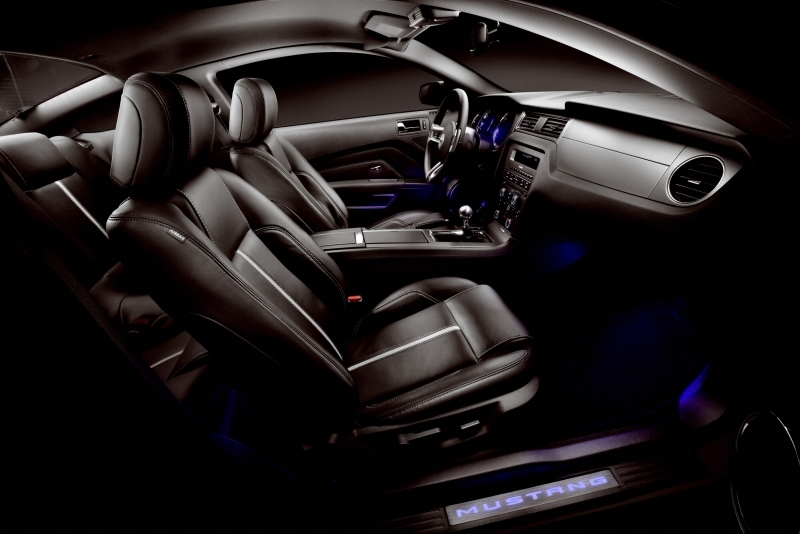 The Mustang’s dashboard is now covered with respectable soft-touch materials, and thoughtful design touches abound. However, the generic buttons on the center stack look like something out of a five-year-old Fusion family sedan, and the door panels consist largely of hard plastics. Trunk space is a handy 13.4 cubic feet, but watch out for the optional space-eating trunk-mounted subwoofer, especially if you plan to put a golf bag or two back there. Although the 2013 Mustang’s front-end modifications are subtle, the new taillights with LED surrounds are an undeniably cool addition. We find ourselves liking the Mustang GT’s styling more and more these days. Ford has done about as much as it can with the current ‘Stang, but when you think about how far this car has come stylistically since its debut back in 2005, it’s pretty impressive. We’re going to lead by example and not even mention the Camaro and Challenger as Mustang competitors here. Figure you’ll have to spend around $35,000 to get a nicely equipped Mustang GT; for that kind of money, you could get a Nissan 370Z or most of a BMW 135i. The Mitsubishi Lancer Evolution GSR offers similar performance in a decidedly different wrapper. You’ll hear plenty about the Camaro SS and the Challenger R/T elsewhere, but we see sophisticated sporting cars like the ones we mentioned as the Mustang GT’s true peers. 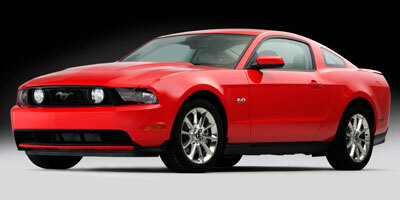 The 2013 Ford Mustang GT is one of the best things America makes. We think we want one. Badly.